More on rorquals (for part I go here), this time looking at the basics of their morphology and feeding behaviour. The rostrum in rorquals is long and tapers to a point (though it is comparatively broad in blue whales) and, in contrast to other mysticetes, a stout finger-like extension of the maxillary bone extends posteriorly, overlapping the nasals and abutting the supraoccipital (the shield-like plate that forms the rear margin of the skull). The dorsal surfaces of the frontals (on the top of the skull) possess large depressions while the ventral surfaces of the zygomatic processes (the structures that project laterally from the cheek regions) are strongly concave, again unlike the condition in other mysticetes. Rorqual lower jaws are immense, beam-like bones that bow outwards along their length. The symphyseal area (the region where the jaw tips meet) is unfused, as is the case in all mysticetes (even the most basal ones) but not other cetaceans, meaning that the two halves of the jaw can stretch apart at their tips somewhat. Exceeding 7 m in blue whales, rorqual lower jaws are the largest single bones in history (ha! Take that Sauropoda). A section of blue whale jaw was once ‘discovered’ at Loch Ness and misidentified as the femur of an immense, hitherto undiscovered tetrapod. Occasionally rorqual skulls have been discovered in which the long lower jaws have been stuck wedged inside various of the skull openings and with their tips protruding like tusks. People unfamiliar with cetacean skulls have then naively assumed that the skull belonged to some sort of tusked prehistoric sea monster. Ben Roesch discussed cases of this (go here), and also noted the case of the Ataka carcass of 1956: a giant beached animal possessing divergent ‘tusks’ that are in fact the separated halves of a rorqual’s lower jaw (see adjacent image). I’ve come across another case of this sort of thing. 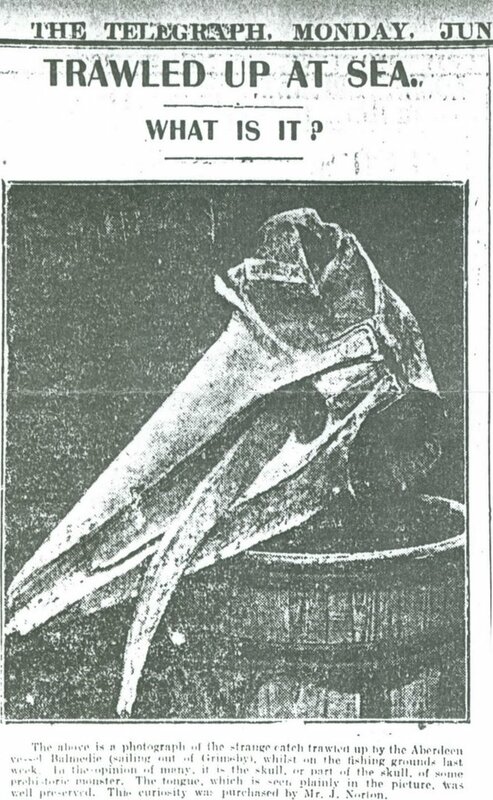 The accompanying newspaper piece, from The Telegraph of June 29th 1908, features a skull trawled up by the Aberdeen vessel Balmedie (sailing out of Grimsby), and thought by the article’s writer to be that of ‘some prehistoric monster’, apparently with tongue preserved. It’s clearly a rorqual skull, and the pointed, narrow rostrum and posterior widening of the mesorostral gutter indicates that it’s a minke whale skull. Moving back to the morphology of the rorqual lower jaw, a tall, well-developed coronoid process – way larger than that of any other mysticete – projects from each jaw bone and forms the attachment site for a tendinous part of the temporalis muscle, termed the frontomandibular stay. All of these unusual features are linked to the remarkable feeding style used by rorquals. How do they feed? Predominantly by lunge-feeding (also known as engulfment feeding): by opening their mouths to full gape (c. 45º), and then lunging into a mass of prey. Those depressed areas on the frontals and zygomatic processes have apparently evolved to allow particularly large temporalis and masseter muscles, the muscles involved in closing the jaw. The frontomandibular stay provides a strong mechanical linkage between the lower jaw and skull and seems primarily to amplify the mechanical advantage of the temporalis muscles. 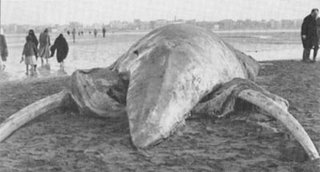 As a rorqual lunge-feeds, an immense quantity of water (hopefully containing prey) is engulfed within the buccal pouch, transforming the whale from ‘a cigar shape to the shape of an elongated, bloated tadpole’ (Orton & Brodie 1987, p. 2898). While a rorqual uses its muscles to open its jaws, the energy that powers the expansion of the buccal pouch is essentially provided by the whale’s forward motion, and not by the jaw muscles. In other words, the engulfing process is powered solely by the speed of swimming. Orton & Brodie (1987) noted that the engulfed water ‘is not displaced forward or moved backward by internal suction, but is simply enveloped with highly compliant material’ (p. 2905). Rorquals do not, therefore, set up a bow wave as they engulf. 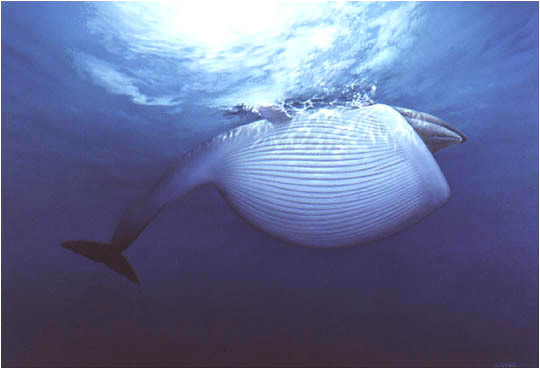 A rorqual may engulf nearly 70% of its total body weight in water and prey during this action, which in an adult blue whale amounts to about 70 tons (Pivorunas 1979). In order to cope with this, the tissues of the buccal pouch must be highly extensible and able to cope with massive distortion. The ventral surface of the pouch is covered by grooved blubber, on which the 50-90 grooves extend from the jaw tips to as far posteriorly as the umbilicus. The ventral grooves can be extended to 4 times their resting width, and to 1.5 times their resting length. Internal to the grooved blubber is the muscle tissue of the buccal pouch, and this is unique, containing large amounts of elastin, and consisting of an inner layer of longitudinally arranged muscle bands and an outer layer where the bands are obliquely oriented (Pivorunas 1977). When a rorqual lunges, delicate timing is needed, otherwise the buccal pouch will rapidly fill with seawater and not with prey. How then do rorquals get their timing just right? It seems that rorquals possess batteries of sensory organs within and around the buccal pouch: there are laminated corpuscles closely associated with the ventral grooves that might serve a sensory function, and located around the edges of the jaws, and at their tips, are a number of short (12.5 mm) vibrissae. Long assumed to be vestiges from the time when whale ancestors had body hair, it now seems that these structures have a role in sensing vibrations. Once a mass of prey is engulfed, a rorqual then has to squeeze the water out through its baleen plates while at the same time retaining the prey. Rorqual baleen plates number between 219 to 475 in each side of the jaw (the number of plates is highly variable within species, with sei whales alone having between 219 to 402), and each plate ranges in length from 20 cm (in the minkes) to 1 m (in the blue). As the whale stops lunging forward, the pressure drops off, allowing deflation of the buccal pouch. Passive contraction of the blubber grooves and active contraction of the muscle layer within the buccal pouch also occurs at this time. For an outstanding sequence of photos illustrating engulfment in action, see Randy Morse’s photos of a feeding blue whale here. So that’s the basics. But there’s so much more to the subject than this. How is it that, during lunge feeding, agile, highly reactive prey remain within the mouth cavity prior to the mouth’s closure? Why do some rorquals make loud noises during lunge-feeding? Why, given their immense size and theoretical high aerobic dive limit, do big rorquals not spend more time lunge-feeding beneath the surface? Why do some rorquals exhibit strongly asymmetrical patterns of pigmentation? And don’t forget that not all rorquals lunge-feed. More on these issues in the following post. The painting at top is from Valter Fogato's site. Orton, L. S. & Brodie, P. F. 1987. Engulfing mechanisms of fin whales. Canadian Journal of Zoology 65, 2898-2907. Pivorunas, A. 1977. The fibrocartilage skeleton and related structures of the ventral pouch of balaenopterid whales. Journal of Morphology 151, 299-314. - . 1979. 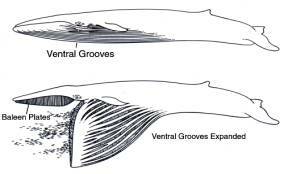 The feeding mechanisms of baleen whales. American Scientist 67, 432-440.